If you can’t find a cab when you need one tonight, AAA is to the rescue. Proposed routes for the High Speed Train through San Jose. I just got back from the California High Speed Rail Authority San Jose – Merced Section open house at Roosevelt Community Center (I read about it here). I was expecting a stage presentation, but what they did was much better. They presented posters around the room and had dozens of representatives on hand to answer questions. The representatives weren’t just from the PR department, but also included engineers, project managers, etc. The ratio of visitors to hosts was probably only 4:1, which gave a great opportunity to ask any question. How much noise is it going to make? Is it going to disrupt traffic? Is it going to block the view of the mountains, or block the sun from my backyard? And mostly the Rail Reps had answers, although maybe some homeowners weren’t satisfied. For example, whatever noise the trains make, the rail builders will “mitigate” them to certain levels defined by federal law. But that might mean a giant view-blocking soundwall. One concern I’ve seen around the net is that these sound walls could be as high as 80 or 90 feet. The rep I talked to said that’s unlikely. On most of the route, the track would be no more than 20 feet above the ground, putting the top of the train about 30 feet up when it goes by. Only in one scenario where the track passes over the 280-101 interchange – which already creates a noisy and unsightly obstruction – would the train be much higher off the ground. High-speed trains use 1/3 the energy of air travel and 1/5 the energy of auto travel. The high-speed train system is expected to cost two to three times less than expanding freeways and airports to meet equal passenger demand. Travel time from San Francisco to Los Angeles is expected to be 2 h 38 m.
The rail project is expected to create 150,000 construction jobs, and spur economic development to the tune of 450,000 permanent jobs in California. I am sure hoping this plan can turn into reality in the near future. I just saw this article on Stretsblog San Francisco, thanks to Jonathan at NNASJ. Basically, if a new bicycle plan passes in City Council on November 17, look forward to some dramatic improvements to bicycle access downtown in the coming years. The city is looking in to some experimental lane configurations (according to CalTrans, although they’re all things that have been done successfully elsewhere) that should make it safer and more convenient to ride major east-west and north-south corridors. Willow Glen Extra reported the other day on a threat to the “Three Creeks” bike trail proposed to link trails along Coyote Creek, the Guadalupe River, and Los Gatos Creek. 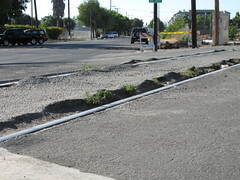 The trail is planned by the city of San Jose to be built along abandoned railroad rights of way, but money hasn’t yet been found to purchase the land. In the meantime, the railroad has sold portions of the land off to other parties, and now one purchaser is planning to build a structure over the proposed trail site. Stucco Supply Co. is requesting planning approval to build a storage area on the land they acquired from the railroad. Because planning approval is needed there’s still time for input from the public. With enough support, the planning department can require the property owner to grant an easement for bicycle access through the site, allowing the bike path to pass through the area without having to be diverted onto busy streets. See the WGx article for more detail, including the names and addresses of appropriate government people to contact if you support development of San Jose’s cycling infrastructure.